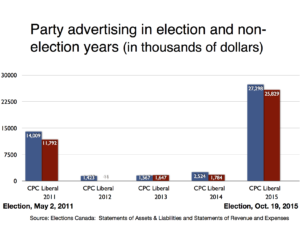 The three national parties have filed their election expenses and there are some surprises but the most important message from the filings with Elections Canada is the central role that advertising plays in modern election campaigns. 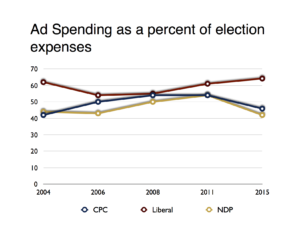 While no one would doubt its importance, the Liberals took it to a new level spending 64% of their election budget on advertising compared to the Conservatives who spent 45% of their election budget on advertising. 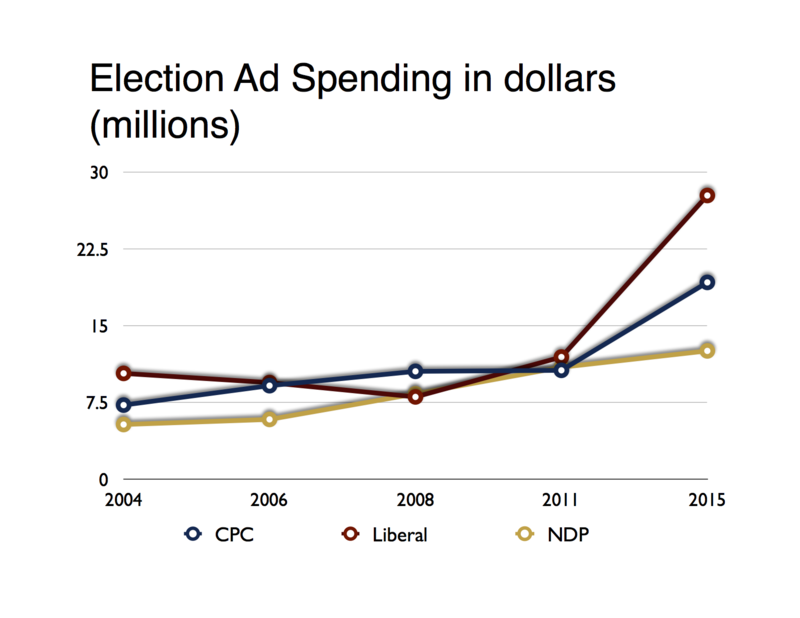 The chart also shows that the Liberals have increased the percentage of funds to advertising over the last four elections. 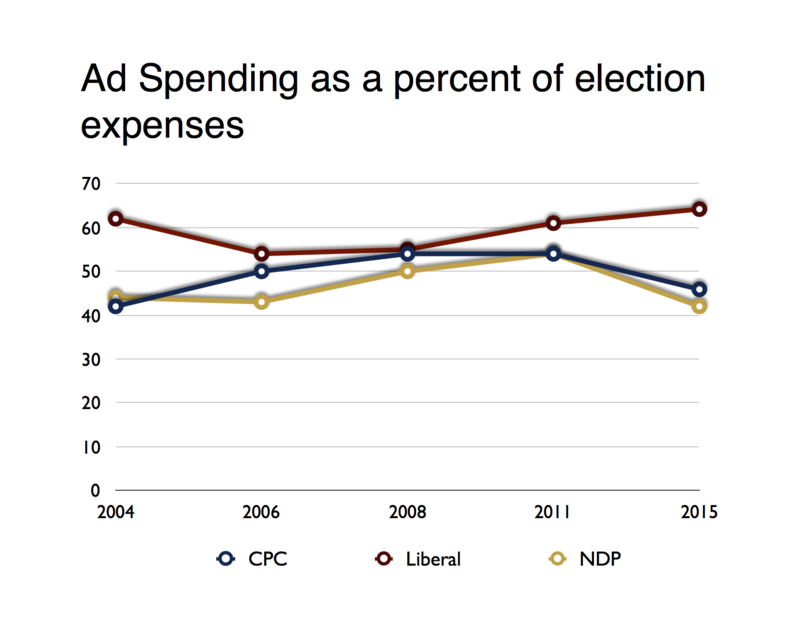 In raw numbers as well, over the last two elections the Liberals are the dominant party when it comes to spending on advertising. 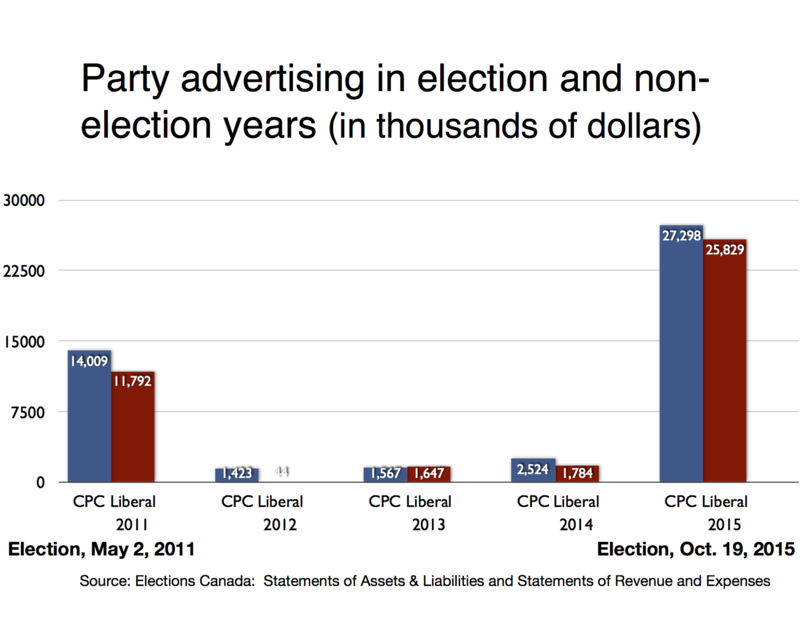 While 2011 was a three way contest for advertising in the 2015 election the Liberals outspent the Conservatives $27 million to $19 million. 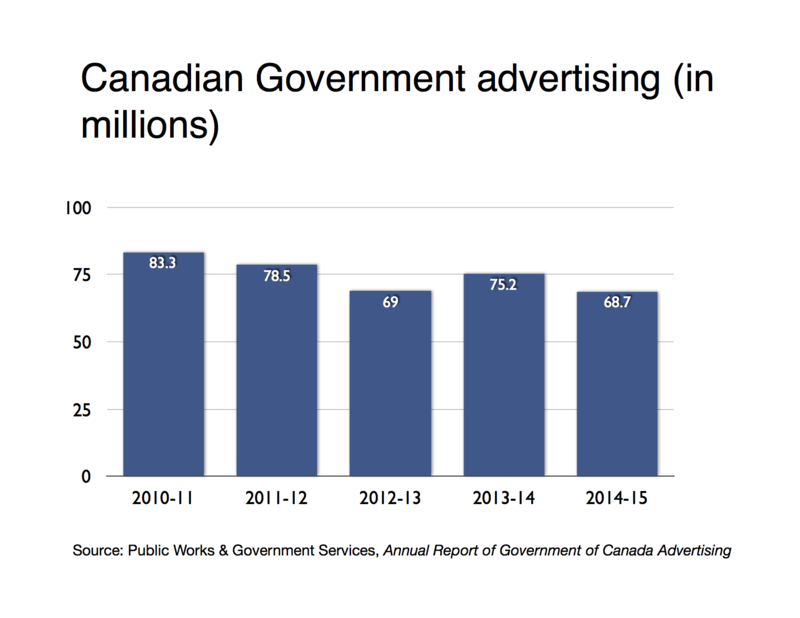 These data are a bit partial because they don’t factor in the significant amount of money that the Conservatives spent on government advertising in 2015. Some of that might not be seen as partisan, though the party was widely criticized for using taxpayers money to do what the party should do. 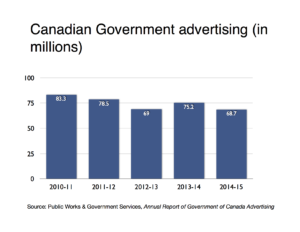 The amount the federal government spent on advertising declined in 2014-15 from the previous year perhaps in part because government regulations prohibit advertising during an election which was the longest in modern history at 78 days. The effective earned media from government advertising before the election cannot be overstated. The party advertising figures also have to be understood in the context of advertising done by the political parties outside of the election period. 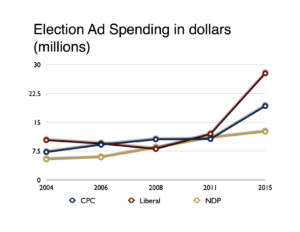 Parties don’t spend money on advertising unless it’s an election year and in 2015 the major political parties spent more money being thrown at advertising than ever before. Both the Liberals and Conservatives were competitive in terms of their spending with the Conservatives spending $1.4 million more. (Data aren’t available for the NDP which has a two month extension to file their party expenses). In some ways, this is the most intriguing data. It demonstrates a loophole for political parties to get around spending limits during the election period. It’s much easier to spend outside of the writ but close to an election when there are no constraints on what parties can spend. What’s not indicated in the red and blue bars are the amount that was spent on radio. The amount of money the Conservatives spent on national radio during the election campaign was “innovative” according to Scott Reid quoted in iPolitics. This innovation apparently was seeded long before the writ: the Conservatives spent $6 million of their non-election advertising budget on radio compared to a paltry $860,000 by the Liberals. These party financial statements confirm the centrality of advertising to political parties and may even underestimate it when non-election and government advertising are factored in. It may not be the nature of the Liberals ‘feel good’ advertising that worked. The party’s success might also be a result of the unprecedented resources it devoted to persuasion and the failure of the Conservatives to leverage the significant resources of government advertising it deployed to its cause.